If you’ve read any of my work or visited my website or Instagram feed, then it is likely that you associate me with journaling, personal writing, and Traveler’s Company traveler’s notebooks. But as much as I believe in the power of personal writing and journaling, I also believe in the power of fitness. While “looking fit” is an awesome bonus that you get when you eat well and exercise regularly, the most important benefits, in my opinion, are the health benefits. At fifty years old, I am not only stronger, faster, and healthier than I have ever been in my life, I am also the only one in my immediate family who does not struggle with hypertension. I credit this, in part, to my lifestyle. For this alone, the time and energy that I spend on myself are worth it. I believe deeply in the connection between the mind, body, and spirit. And yet, here we are in February. We are only one month into 2018 and research tells us that 80% of people who set New Year’s goals will have failed by now. And I bring up New Year’s goals because, while 32% of people asked say they don’t set New Year’s resolutions, of those who do, fitness goals are at the very top of the resolutions list, year after year. As a fitness enthusiast and a certified personal trainer, I am disheartened by this because I understand the struggle, but I also know the benefits. Changing your behavior and sticking to any new routine simply isn’t easy. Changing behavior doesn’t just take willpower. We can have the best of intentions and still fail if we don’t plan ahead. There are a number of strategies that can help you stick to your fitness goals, goals that I hope will one day move beyond resolutions and become lifelong lifestyle changes. Eating well and exercising are not simply things that you should do for 10 weeks to fit into that dress for the banquet or that bathing suit this summer. The benefits are much greater than that. They include a reduction in excessive weight, stress, and certain health issues, as well as increases in sleep and self-reported happiness. One strategy that has been proven to work and will help you stick to your goals is writing them down. Not only am I a fan of writing things down, I am also a fan of traveling lightly (though as chunky as my notebook is these days, you may doubt me). The BK Dashboard, which comes in a pack of twelve, each good for one week, provides you with three months of tracking sheets for whatever you choose to use them for, but they work great for logging fitness goals and progress. The front of each BK Dashboard provides a space for the date and an area to make a checklist. If you have specific fitness goals, measurable and realistic intermediate steps are a must for success. When you open up the BK Dashboard, you’ll find spaces for each day of the week, plus an area on the bottom for writing. The back provides you with more writing space. These days, a lot of what I personally do is tracked in different ways, and I suspect others may experience this as well. I train at a personal training studio, where all of my data is kept in my client file. I know the same is true when people work out at regular gyms. Often data is tracked on a chart that stays at the gym. 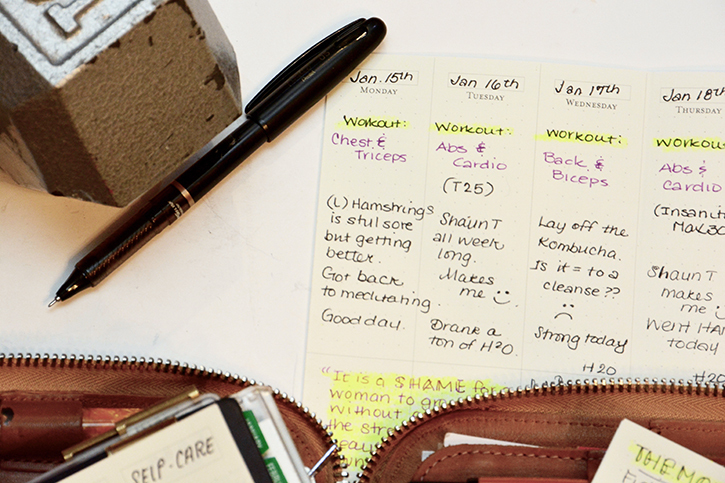 When I strength train at home, I keep my actual routines in a notebook, where I can track my exercises, weight, and a number of reps and sets. When I was trying to lose weight several years ago, I tracked my meals and macronutrients with MyFitnessPal. My running is tracked by the NIke+ Run Club app. And so with all of this information tracked in some way, what’s left? Data is important. It is measurable and lets us know how we are progressing in quantifiable ways. But wellness is not only about doing, it is also about planning, learning, and being. Keep track of questions that pop up. Make note of recipe ideas. Keep track of your daily mood. Keep track of your daily water intake. Plan your workouts for the week. Write down a motivational quote. Plan ways to reward yourself. The Dashboard is great for this and so much more. It’s versatility and minimalist form make it an ideal fitness companion that can adapt in so many ways, as you continue with what I hope is a lifelong fitness journey. Now, if you are one of the 80% of individuals that have already given up on your New Year’s resolution, and it included living a healthier life, then I encourage you to recommit yourself today in the month of love. Self-love is the most important love there is, and you are worth it. I love your posts and follow you on Instagram. Can you tell me more about your zippered portfolio and where you got it. I need something to close so that I don’t lose papers, etc. You are always so inspiring in so many ways! I started running again because I finally got doctor’s permission to do so. It’s been two years and I’m lazy. I was doing well until I threw my back out and was off a week. Now I’m having a hard time restarting. Thank you for the inspiration AND for the ideas about documenting!